ABW Mobile Relay Services is a system intended to allow mobile devices such as tablets and smartphones to store large amounts of data locally and keep that data updated with little or no intervention by the user. Although these devices will access remote data servers, they require some type of connectivity for the application to function properly. Access to remote data servers does not provide the quick response like data stored on the device. We provide our base ABW Mobile application that currently operates on iPads and Android tablets. 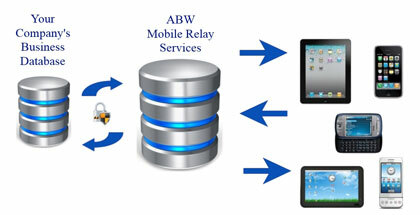 ABW Mobile only gets its data through ABW Mobile Relay Services. Since we developed this application, we have extensive experience connecting mobile devices to ABW Mobile Relay Services. We also will provide your programmers with modules of code to get them started. If you need to provide large amounts of corporate data securely to mobile devices and keep it up to date effortlessly, you need to consider ABW Mobile Relay Services.